Long time NCNO member Mike Breed passed away this last month. Members of the club prior to 2000 remember him well. Mike approached life full throttle, and that got him into trouble from time to time. Club members have plenty of Michael stories. 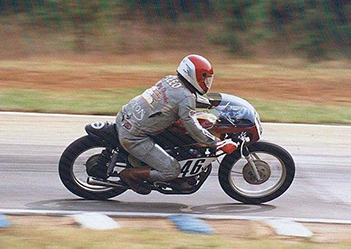 He was one of the fast riders in our club, and raced Nortons, Velos, and Ducati 250s. He loved Nortons, and rode his 850 85K miles until the motor blew up. A smooth talker and promoter, he set up a NCNO group lap during the lunch time break at one of the WERA race events at Summit Point. I spent many enjoyable evenings in the garage with him. 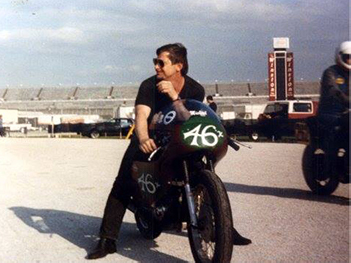 Besides his 850, and his 750 race bike, he owned a 69 Fastback, a 47 Model 18, a Manx engine and a 73 BMW 750. He was a native of Birmingham, AL. He had a part time job with the fire dept. while attending college. After he was ordered to turn fire hoses on demonstrating black people, he quit the job. Upon returning to his home town, he looked after his mother, who is still alive at 91 years. He told me that one of his most rewarding jobs was teaching sports to elementary school students, even if the pay was poor and they give him the cold of the week on a regular basis. Future Michael stories will be submitted in following issues. The glow of his tail light disappearing is still in my memory bank. Michael was one of the original members of NCNO, and was the recording secretary (or self-described 'Scribe') who wrote the bulk of the NCNO Flyer newsletter for many years, and he also served as club president.